The scene over Pateros, Washington, on July 18. If all goes according to plan, Dara Farmer will take a much-deserved vacation in November. A trip to Hawaii, Mexico or even sunny Arizona is preferred. If that plan keeps up accordingly, Frank Rogers will take time away from his duties as sheriff of Okanogan County to hunt — after a summer with barely a day off. Vacation? What's that? But Mother Nature often has little regard for people's recreation plans. Both Farmer and Rogers expressed those idyllic plans in August, in the midst of what everyone will admit was an extremely trying and stressful summer for residents of the Methow Valley and Okanogan County. At that time, mudslides and flash floods had just inundated the region, destroying or damaging at least 10 homes and closing multiple highways and roads. That's significant at any time, but this was the area that only weeks earlier was at the epicenter of national news as the Carlton Complex fire ballooned to 250,000 acres and destroyed an estimated 300 homes. As an employee at the Cinnamon Twisp Bakery in Twisp, Wash., Farmer saw up close the needs of the community reeling from the fires and later mudslides. At the height of the fire crisis in late July, the bakery was closed as power was cut off to most of the Methow Valley. Farmer and her fellow employees set up shop outside, giving away coffee and pastries for donations to help fire victims. Their makeshift bake sale served much more than coffee to passing journalists. It became a community gathering place of sorts, where people who were displaced or just looking for information about the rapidly spreading fires could come and chat. Many residents were without a landline phone, and Farmer says the "community" cellphone they placed on their table became a necessary means of contact for residents trying to communicate with family and friends cut off from the valley. Their table was also a place for emotional release during a very stressful time. "We've offered a lot of comfort and support," Farmer said in July. "If people need a hug, I give hugs 24/7. The awareness and hugs are on our menu." With any disaster, the passage of time brings the realization that some semblance of normalcy will return. Or at least that's the hope of aid organizations, governments, and most importantly, victims. As summer turns to fall and winter, the hope for victims of the fire and mudslides is that normalcy isn't out of reach. With Red Cross shelters closed and news crews long since moved on, the focus now is for residents to rebuild their homes — and their emotional well being. Bill Murray is one person helping in that process. As a mental health professional based in Wenatchee, he has long helped people in need of counseling in north-central Washington. 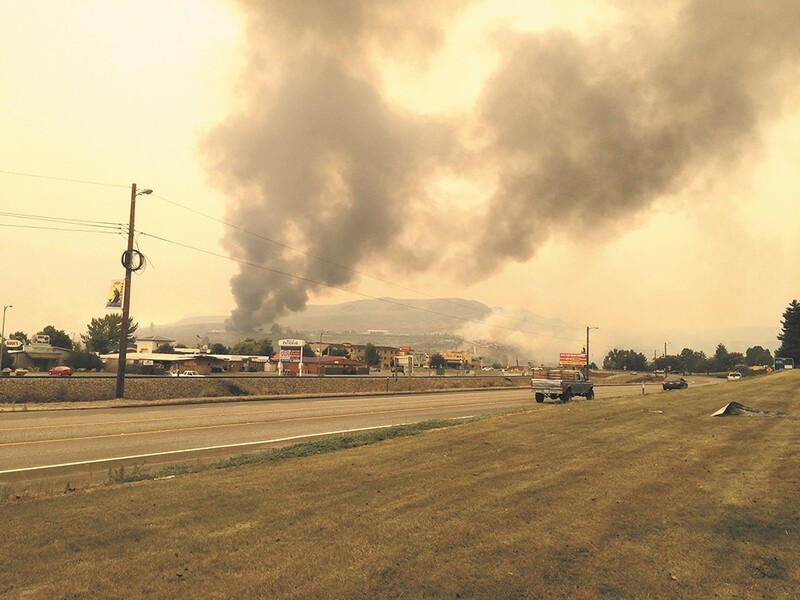 The Carlton Complex fire in July was his first time putting those skills to use in a disaster situation with the Red Cross. He worked two weeks at a shelter in Brewster after the nearby town of Pateros had been hit hard by the fire. "People came in in shock," Murray says of the initial disaster response. "They just came walking in the door looking like they were in shock, and you didn't need to be an expert to recognize it." At that time, Murray and his fellow relief workers focused on meeting the immediate needs of fire victims: giving food and shelter, mapping out a plan for addressing living needs in the short-term, and counseling for the initial shock of loss. As time passes, Murray says, most of that shock and anxiety will wear off as people rebuild and move on. But some people will have lingering mental health needs. There are signs to look out for that indicate deeper issues — and the need for more long-term counseling. He says for six to 12 weeks, most people will go through periods of crying, depression and anxiety, with difficulty sleeping and eating. But that's typical in these kinds of situations. 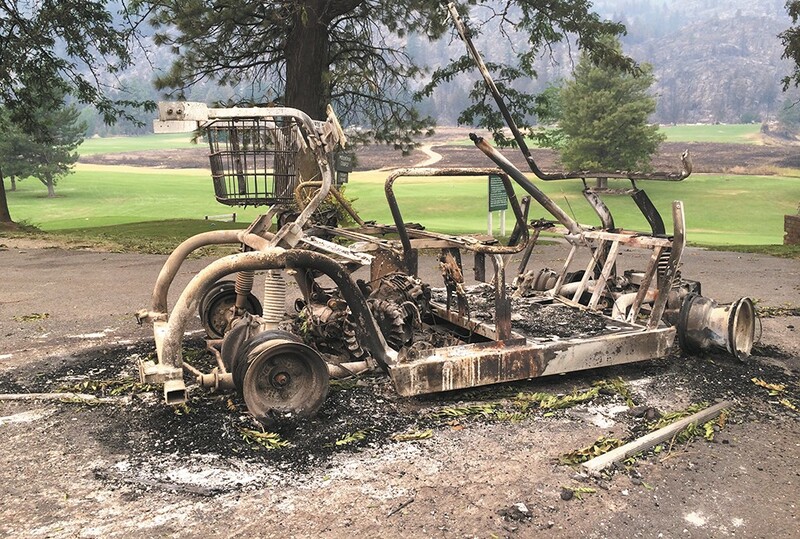 This golf cart near Alta Lake was incinerated, while the Carlton Complex fire jumped most of the course itself. "Those aren't symptoms of clinical depression," he says. "But if you get four to six months down the road and symptoms are still there for significant depression or anxiety, that is a sign of need for deeper mental health counseling." For those with long-term needs — from mental health counseling to physically rebuilding or finding permanent shelter — aid organizations are "in for the long haul," says Nicolle LaFleur, executive director of the Red Cross Apple Valley and North Cascades.